Home » Results » Web Design Portfolio » Fitzgerald Bros. Into their 6th generation of ownership, the Fitzgerald Brothers is a locally famous beverage distributing and full-service beverage vending company. Known as the oldest family-owned business in the Glens Falls area, the Fitzgerald Brothers know what it takes to succeed in business. When it came time to update their website, they partnered with Mannix Marketing for a modern-looking website with more personality and integrated social media marketing tools. Their older website wasn’t as fun or youthful as they’d hoped. Yet, they wanted to ensure it still looked professional. We were able to help them achieve a better social media presence into their site. They wanted customers and their customer’s customers to engage more. The products they deliver on a large scale still resonate with individuals and Fitzgerald Brothers wanted to build those connections. The site was built with more refreshed and modern color logo combinations. 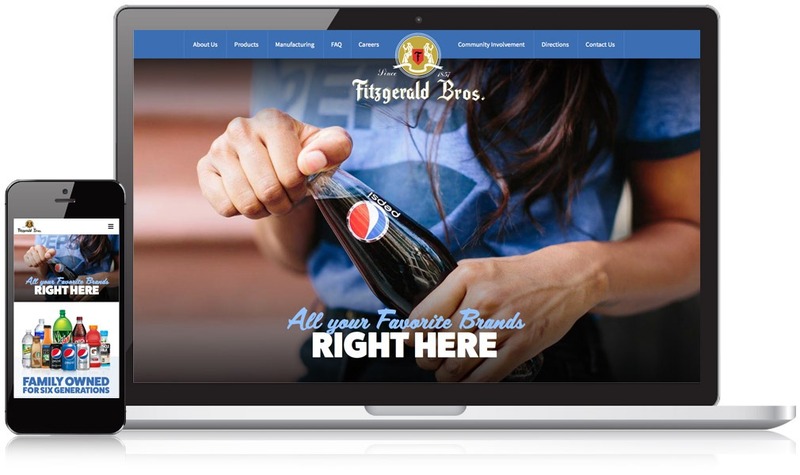 Fitzgerald Brothers wanted a larger social media presence and although the company is a Glens Falls Beverage Distributor, they knew they could reach an even larger scale due to the products they sell and the customers they serve. The website is more interactive and they committed to resources in-house to support their need for social media work. It was time to look for additional team members and posting those positions on social media was the perfect place to find that audience. Mannix worked with Fitzgerald Brothers to ensure the website was clean, clear and user friendly. The site is now easier to update and less complicated to handle. The Fitzgerald Brothers team knows user experience is key for business not only for the external clients but for their internal team as well. Want your business to thrive online? We’ll make it happen. Call Mannix Marketing today.